At a meeting of his Irish Parliament in Drogheda in 1460, Henry VI declared (via his Lord Lieutenant, Richard, Duke of York) that a separate currency (silver coins) be struck in Ireland at the castles of Dublin and Trim and that it would be known as Irlandes d’argent (Irish silver). He further declared that the existing Irish coins (known as Jacks) “be hereafter of no value and void”. Depending upon which way one is exchanging these coins, the loss for the Irish economy was 20-25% and Henry VI was, in effect, draining Ireland of its silver via a ‘forced / legalised’ internal arbitrage market in Dublin and Trim. This would not have endeared him to his feudal vassals in Ireland whose tenuous hold on their lands were not helped by an overnight 20% reduction in the value of their money. Meanwhile, in England, the Wars of the Roses (a series of civil wars fought from 1455 to 1487 between the House of Lancaster and the House of York) raged on and shortly after this declaration, Henry VI was captured by the Lancastrians – a Lancastrian king (Edward IV, who took over the monarchy after the Battle of Towton Moor) would rule (temporarily) from 4th March 1461 to 3rd October 1470. A further 20-25% loss due to ‘clipping’ is clearly admitted here and the English king is not prepared to accept the loss himself, so it would seem that the clippers were allowed to go unpunished – despite the harsh penalties, if caught. 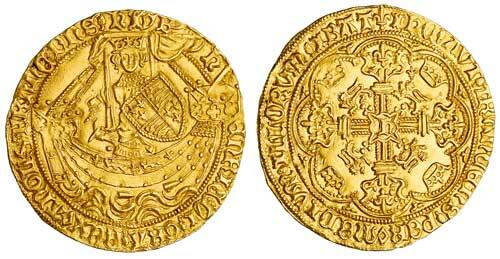 Very few examples of Henry VI’s Irlandes d’argent coinage have been found, i.e. they are very rare. That the English noble of lawful weight shall pass in Ireland at the value of eight shillings and four pence, and half-noble at four shillings and two pence, the quadrant-d’or of the same coin and weight at two shillings and one penny. The gross [groat] of London, York and Calais, not clipped within the extreme circle, at five pence, the derny-gross at two pence half-penny, the denier at one penny farthing: the gross clipped at four pence, the demy -gross at two pence half-penny, the denier clipped at one penny. And as not only the duchy of Normandy but also the duchy of Guienne, when they were under the obedience of the realm of England, yet were no less separate from the laws and statutes of England, and had also coins for themselves different from the coin of England; so Ireland, though it be under the obedience of the same realm is nevertheless separate from it, and from all the laws and statutes of it, only such as are there by the lords spiritual and temporal and Commons freely admitted and accepted of in parliament or great council, by which a proper coin separate from the coin of England was with more convenience agreed to be had in Ireland under two forms; the one of the weight of half-quarter of an ounce troy weight, on which shall be imprinted on one side a lyon, and on the other side a crown , called an Irlandes d’argent, to pass for the value of one penny sterling ; the other of vij. ob of tray weight, having imprinted on one part of it a crown, and on the other part a cross, called a Patrick, of which eight shall pass for one denier. That a gross be made of the weight of three deniers sterling, and to pass for four deniers sterling, which shall have imprinted on it on one side a crown, and on the other side a cross like the coin of Calais, bearing about the cross in writing the name of the place where the coin is made ; and that every person, who brings bullion to the mint, ought to receive and have for every ounce of silver tray weight, nine of the said grosses of the value of three deniers. That the coin called the Jack be hereafter of no value and void, and that the above coins be made in the castles of Dublin and Tryrnrne [Trim]. This act to commence on St. Patrick’s day. Who was Richard, 3rd Duke of York and 8th Earl of Ulster? Rather surprisingly, this Richard, the 3rd Duke of York was not only a Yorkist working for a Lancastrian king in Ireland but he was also a rival for the throne – his son (Edward) was 4th Duke of York, 7th Earl of March, 5th Earl of Cambridge and 9th Earl of Ulster when he became Edward IV of England soon after this Act of 1460 … in March 1461 ! Richard of York, 3rd Duke of York (1411–1460), was a leading English magnate, a great-grandson of King Edward III through his father, and a great-great-great-grandson of the same king through his mother. His criticism of the Council’s surrender of the French province of Maine, in return for an extension of the truce with France and a French bride for Henry, must have contributed to his appointment on 30 July as Lieutenant of Ireland. Domestic matters kept him in England until June 1449, but when he did eventually leave for Ireland, it was with an army of around 600 men. This suggests a stay of some time was envisaged. In 1450, the defeats and failures of the English royal government of the previous ten years boiled over into serious political unrest. In June, Kent and Sussex rose in revolt. Led by Jack Cade (taking the name Mortimer), they took control of London and killed John Fiennes, 1st Baron Saye and Sele, the Lord High Treasurer of England. In August, the final towns held in Normandy fell to the French and refugees flooded back to England. In August 1453, Henry VI suffered a catastrophic mental breakdown. Perhaps brought on by the news of the defeat at the Battle of Castillon in Gascony, which finally drove English forces from France, he became completely unresponsive, unable to speak and had to be led from room to room. The Council tried to carry on as though the king’s disability would be brief. However, they had to admit eventually that something had to be done.